GX amplifiers deliver just the right amount of power to the most popular speakers used by entertainers. Most loudspeaker manufacturers recommend an amplifier with power output equal to the speaker’s Program (Music) Power rating or two times (2 x) the Continuous (RMS) Power rating. The GX5 supplies maximum possible power to 4 ohm and 8 ohm loads. Owners of popular 4 ohm loudspeakers (dual-woofer, two-way models and many subwoofers) will find the 700 watt (4 ohm) power of the GX5 an ideal match. A subwoofer reduces strain on the full-range speaker, allowing it to play louder, or letting a smaller speaker do the same job. 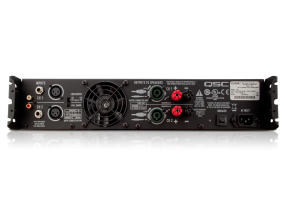 The GX Series supports this mode with a Crossover switch that splits the full-range input - sending 20 Hz -100 Hz to the sub (Ch 1) and 100 Hz - 20 kHz to the top box (Ch 2). 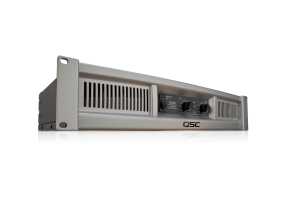 The front panel gain controls balance the sub and top box, while GuardRail optimizes peak power into the sub and top individually, for greater musical impact and dynamic range. 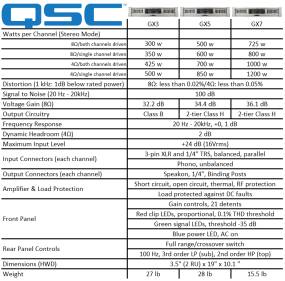 See our comparison chart to find out which GX Series Power Amplifier fits your needs.